This recipe has been a big hit at our house for awhile now. Everyone wants tofu scramble for breakfast! It's such a delicious savory option with a really nice garlicky, peppery flavor and the textures are wonderful - it's just such a nice comfort food to start the day with. There really aren't too many steps to it, either, so it's not too daunting on a weekend morning. Everyone can be enjoying tofu scramble in about 30 minutes (yes, including vegetable prep)! We used to eat eggs very regularly, and my husband in particular had been pretty attached to them. When we've tried scrambled tofu in restaurants we weren't very impressed, so I wasn't sure he'd go for my tofu version. But when he first tasted this scrambled tofu, he got so excited! I'm not quite sure what I'm doing differently from the restaurants we've tried, but I'm glad it's satisfying that desire for savory, cozy comfort food for breakfast. One key to this scramble is kala namak. (Did you just go, "Huh?" I get it - I'd never heard of it until recently, either.) Kala namak is a sulfury Himalayan rock salt used in Indian cooking, and you know what sulfur smells like, don't you? Yep, eggs! So it is just the thing to help tofu have that eggy vibe. I've made this scramble without kala namak and everyone still loved it, but kala namak takes it over the top! 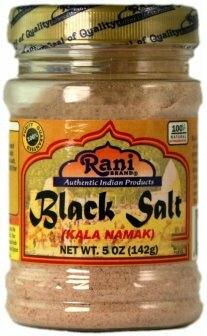 (Kala namak can be hard to find, so I've added a link below for purchasing it through Amazon.) Another key ingredient is turmeric, which gives the tofu that yellowy color like scrambled eggs. The visuals can be just as important as taste! So even if you're skeptical about the idea of scrambled tofu, I hope you try this version. It is "eggy" in color and flavor, yet I don't think of this tofu scramble as an attempt to recreate the entire egg scramble experience, and it could be disappointing if you are used to eating scrambled eggs and think this is going to be exactly the same. It's more about capturing that savory-comfort-food-for-breakfast vibe that scrambled eggs - and scrambled tofu - can provide. Pressing tofu for tofu scramble. Photo by Kari of Beautiful Ingredient. 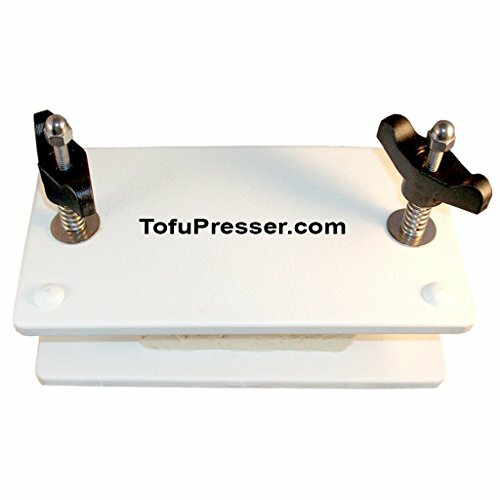 Prefer an actual tofu press? Check out the one below, featured with the recipe. Kala Namak (black salt) and tofu scramble spice mix, Photo by Kari of Beautiful Ingredient. Mise en place for Tofu Scramble. Recipe and photo by Kari of Beautiful Ingredient. Author's note: This recipe uses the water-drop method of cooking, which eliminates the need for oil. A stainless steel pan works well for this. If you don't have one, check your pan's manufacturer's instructions to make sure it can handle the heat. For the most part, you shouldn't end up with ingredients sticking to the pan too much, at least not any more than you would scrambling eggs in oil. Keep scraping the bottom of the pan to help. While you can certainly use a cooking oil like avocado oil instead of going oil-free, I'm finding I really don't need oils for stir frying or sauteéing very often, and save the use of oils for instances when they really make a difference, such as in the finishing of some dishes. Kala Namak, or "black salt" isn't really a black color - it's a Himalayan rock salt that's slightly pinkish and is best known for having a very eggy smell - so it's perfect for scrambled tofu! It totally makes a difference and I hope you try it; it's ok to use the salt you have on hand as a replacement, though. I buy organic ingredients whenever possible and always buy organic tofu. I like to work lots of veggies in to this scramble, but feel free to omit or replace the veggies in this recipe with your faves. A fun variation: Try adding your favorite vegan sausage with the onions and mushrooms - so good! TOFU: Drain the tofu block and wrap it in a clean dry towel or paper towel. Place the wrapped tofu on a cutting board and then set a panini press or heavy cast iron pot lid on top. Make sure the heavy object is firmly in place and won't slide off, and that the cutting board with the wrapped tofu is away from the edge of the counter (just in case it does slide off). Alternatively, use a tofu press following the instructions it came with. VEGGIES: While the tofu is pressing, prep the veggies. 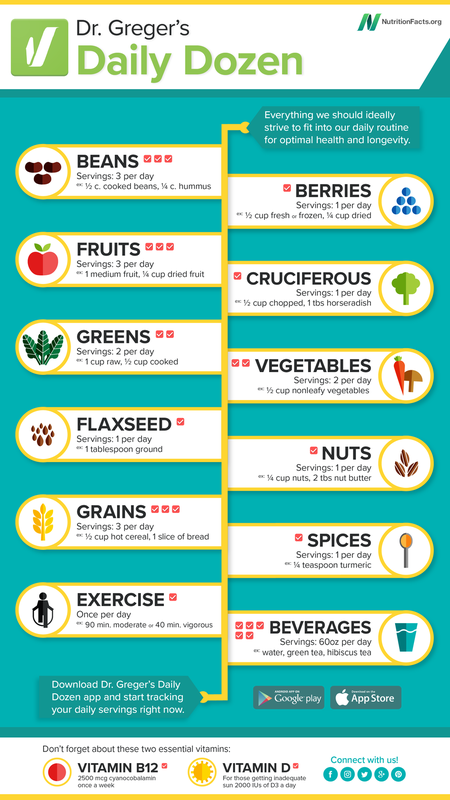 Keep the ingredients separate as you work. Dice the onion and bell pepper, slice the mushrooms and smaller peppers, mince the garlic, and coarsely chop the kale. 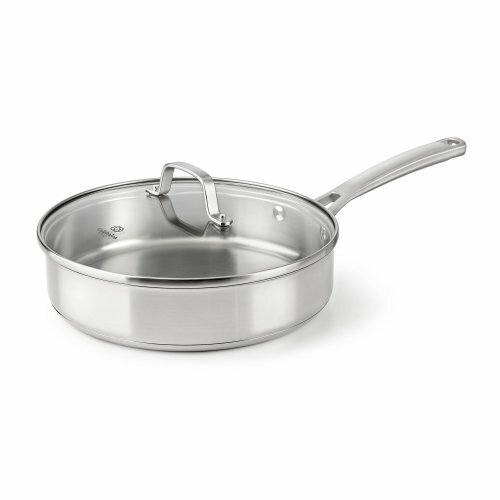 PREHEAT PAN: Heat a large, deep stainless steel pan over medium heat until a bit of water splattered into the pan forms a ball. You'll be working on the spices while it preheats, and it should be about ready when you're done. Test it, and if not, keep flicking a little water in now and then until it forms the ball (don't worry, it eventually will! It's pretty awesome when it does, too). If it's taking more than 5 minutes, turn the heat up a little more. Important: When it passes the water-drop test (water forms a ball), turn the heat down to medium to help avoid burning your ingredients. 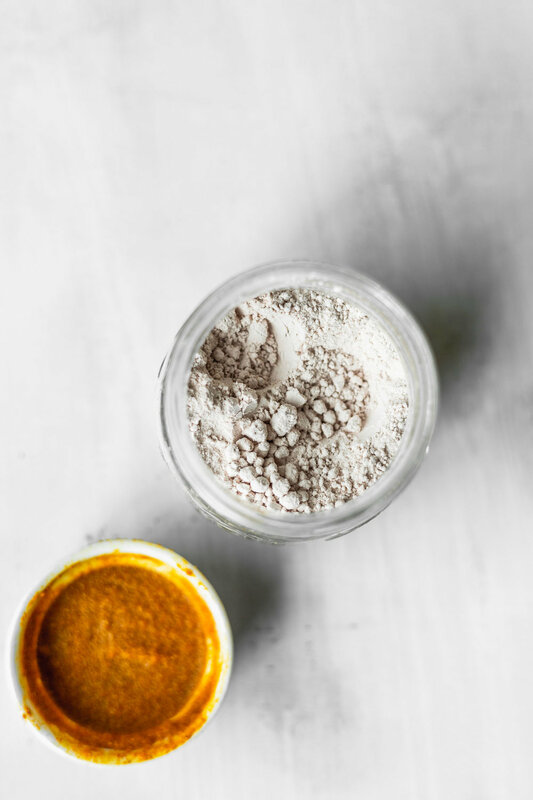 SPICES: Meanwhile, while the pan is heating, stir together the spices (nutritional yeast - paprika) and 1 tablespoon water in a small bowl. Mix well. COOK: When the pan is ready, add the onion and mushrooms, stirring frequently for a few minutes. Because you've heated the pan well, there shouldn't be much sticking. When the mushrooms begin to soften and brown, add the peppers and garlic and stir another minute. Unwrap the tofu and crumble it into the pan by grabbing chunks and separating it with your fingers into smaller pieces. Give it all a good stir, breaking up the pieces further if necessary, then use a spatula to add the spice mix to the tofu. Stir until all of the tofu becomes yellow, scraping the bottom of the pan to keep the spices and tofu from sticking. Let cook a couple minutes, then stir again. After a couple more minutes, add the kale and stir. Cook another minute to wilt the kale. SERVE & ENJOY: Season with either table salt or kala namak and black pepper to taste. 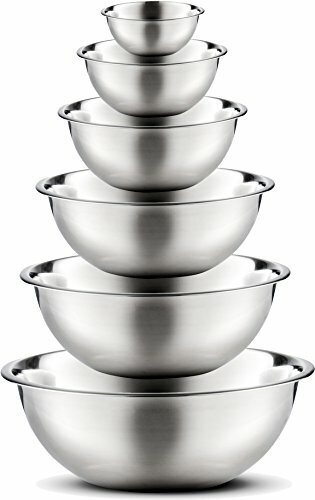 The following kitchen tools are available on Amazon to help make this recipe. Arrangements have been made with Amazon to connect you directly with the products when you click the links below. From there, you can find more info and decide about your purchase. Purchases made through the link below provide us with a small "finder's fee" as a thank you from Amazon for connecting you to them - thank you for your support!